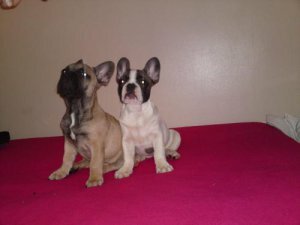 2 Heritage French Bulldog Puppies - Boy & Girl, Male & Female, fawn boy and white with spots girl, We have 2 stunning heritage and Registered French bulldog puppies who were born on the 24th of August 2013. 1 little fawn boy and 1 white with sandy spots Girl. These little pups are absolutely amazing and would make a perfect friend for you and your family. Amazing personality, very good around children and already 90% toilet trained pups... Pictures of parents and Pedigree papers, vaccinations, health checks, and microchip proof available on request Ready to leave now.